Are you a geek, nerd, and/or cosplayer seeking to weave your favorite fantasy into daily life—more specially, a yogi who wants to “geek out” in the yoga studio (or a potential yogi-geek seeking the right atmosphere to do so)? 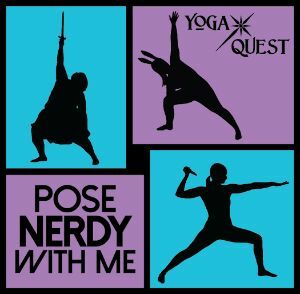 Then YogaQuest may be just the place for you: where yoga classes are set to the scripts of popular fandoms, such as Harry Potter, Lord of the Rings, Star Wars, Buffy the Vampire Slayer, and many more! (Costumes are encouraged, but not necessary.) Yep, that’s right: We are talking about a place where you can feel free to be your unicorn self (or your mermaid self, or your vampire self) if you so desire. And a place where you won’t feel judged, either—because cloaking your yoga in mythic duds is the norm here. Is your curiosity piqued? 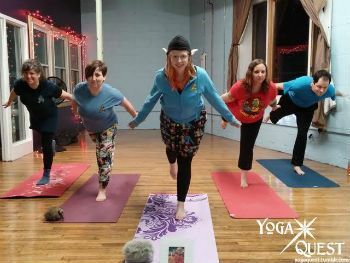 Read on to learn more from YogaQuest founder Justine Mastin (aka Justini Yogini) about making yoga a little more geeky, lighthearted, accepting, and (most of all) fun! You’ve mentioned that yoga can be “just as weird as you are,” and that part of the reason you created YogaQuest was to “get geeks moving.” We've definitely been talking a lot lately about the importance of making yoga more accessible to all, but I'd never really considered that yoga wasn't weird enough or geeky enough. How do you define the term “geek”? And how does the yoga community underserve people who self-identify this way? We use “geek” as a catchall to describe people who unabashedly love some “thing,” such as a pop-culture phenomenon, tv show, or movie fandom. In our studio you will find geeks of different stripes—word nerds, sci fi fanatics, and cosplayers, just to name a few. A lot of the time, geeks don’t realize that they can care for themselves—or that they can find self-care methods that fit into their lifestyles. Mainstream wellness communities can be a difficult place fopeacr a lot of us. Geeks (my community) tend to have jobs that have us sitting at computers during the day, and often our after-work recreation is centered around computers, video games, or television. There’s often an assumption that we don’t want to care for ourselves (due to the way we see geeks portrayed in the media—images of sloth and gluttony). But the reality is that a lot of the time, geeks don’t realize that they can care for themselves—or that they can find self-care methods that fit into their lifestyles. Due to past experience, they might even feel they aren’t “worthy” of wellness either. I hear similar stories all the time from my students: they tried to improve their well-being and they were shamed for it. Some of them talk about being “mooed” at while jogging, or being eyed up and down when they visited a traditional yoga studio. And many of our students have a history of gym trauma—where they felt they were often teased for how they looked, or simply for how they are. So, how does YogaQuest challenge these myths and get people moving? YogaQuest aims to obliterate that message [of unworthiness] and be a haven for all those who haven’t found a safe space. We reiterate this message daily: Each and every person is worthy of self-care. And we serve our students in a number of ways. For students who are local and physically able to come to our studio, they will find that this isn’t a traditional “yogic” space. Our walls are covered in pop culture art prints, signed celebrity photos, and even a crocheted unicorn head (yes, really!). We keep action figures and other toys in the studio and students are encouraged to take them into their practice. We call them “mat monsters.” We have a deep reverence for the wise words of Carl Sagan, Spock, and Buffy the Vampire Slayer, so we bring these inspiring figures to the yoga mat. Even if folks don’t live close enough to come see us at the studio, they can still experience what we do. 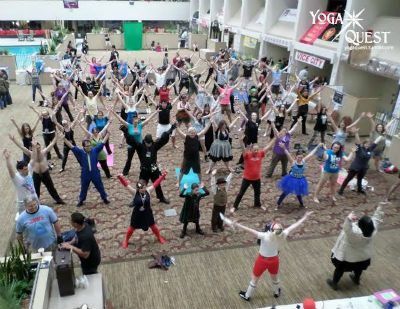 We appear at pop culture conventions around the country so that we can bring our yoga to the people we want to serve. The focus of all of our practices at the studio is finding a way to reach our students in their own language and to promote emotional well-being. We have appeared at Wizard World conventions, Emerald City Comic Con (ECCC), Chicago Comic and Entertainment Expo (C2E2), as well as local conventions in the Minneapolis area, and we’re adding more appearances all the time. We also have a strong online presence, since that’s where we nerds spend a majority of our time, and we’re finishing up a DVD so that folks can take the YogaQuest experience home with them. The focus of all of our practices at the studio is finding a way to reach our students in their own language and to promote emotional well-being. Sounds like you have a strong community. Those aren’t easy to come by. Geeks tend to be introverts by nature, so we center much of our efforts around community-building. Much of this involves creating a space where everyone feels safe and feels free to express their individuality. Our students can come in late and leave early. And we don’t keep a silent studio, so students can connect and build relationships. They’re encouraged to do what they feel during class, even if that means having a seat and tweeting (but don’t forget to hashtag us!). You've covered fanfiction related to Doctor Who, Star Wars, Harry Potter, Xena: Warrior Princess, Monty Python, Princess Bride—the list goes on and on! How do you decide which story to work with, and how does it play out in class? Geeks are constantly reimagining how the world could be through their fandoms—now we’re actually doing it, and there are all sorts of reasons why we pick the fandoms that we do for our narrated yogic adventures (aka quests). The most important reason is that we love them. Sometimes a student will suggest a fandom that they want to explore and sometimes we will pick a theme based on the time of year (such as monster movie themes for October). Usually our scriptwriter/narrator/curvy yoga teacher (Jenny Milos) discovers a new fandom and spontaneously announces it. We’ve been doing this since 2011 and have come up with new scripts nearly every week; we’ve also accumulated quite a library! I've noticed via your social media sites, and your website, that your students often wear costumes. Looks fun! Do students generally dress up based on the theme of the class, or can they do their own thing? Also, are there any costumes that are contraindicated for yoga? Students are always welcomed, but never required, to wear costumes for quests. 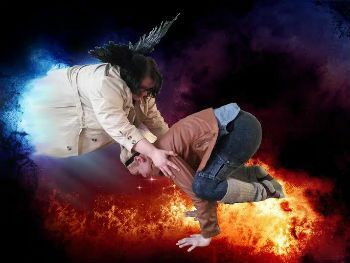 Some fandoms will naturally attract cosplay—such as the tv show Supernatural—where the protagonists dress in flannel (suddenly the class seems to be a bunch of lumberjacks!). When we do quests at conventions, many of our students are in cosplay for that event, so it isn’t specific to the fandom that we are presenting. We’ve had students come to class in quite elaborate cosplay, and they’ve participated as much or as little as is comfortable for them. It’s part of that permission that we give for students to do what they want and need, not what a teacher tells them to do. We once had a student come dressed as a Teenage Mutant Ninja Turtle, complete with shell! He had a pretty sweet horse pose. Just reviewing the info about YogaQuest online makes me want to try it out, and the yoga culture created here seems so lighthearted that just reading about it instantly lifted my mood. Do you feel we take ourselves too seriously? We’re far too serious—from the clothing we are “supposed to wear,” to the way we’re “supposed to behave,” even to how our bodies “should look” and how our bodies should be able to move. And although these rules are generally unspoken, they are implied as loudly as if they were spoken outright. We follow self-imposed rules and don’t even consider whether they're useful. But I believe that our true skill is in our ability to adapt the practice for the students we serve, not in our ability to teach just as our teacher taught, no matter how inspiring that teacher might be. What tips could you offer us? 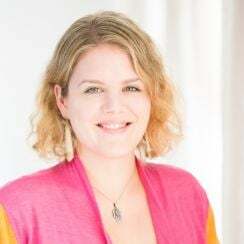 I would ask yoga teachers what they feel they’re adding to the larger yogic conversation—how they are helping the yoga world to grow and including the students who need yoga but feel it is inaccessible. How about we meet people where they are at instead of telling them where to be? I would ask yoga teachers what they feel they’re adding to the larger yogic conversation. Some will say—and have said—that what we do isn’t yoga. This is fine with me. I have achieved what I set out to do and created a safe space for a community that I care about to feel free to explore their authentic selves without judgment. My students are gaining a greater awareness and appreciation for their own minds and bodies, and are finding bonds of friendship with others—a community. If that isn’t union, I’m not sure what is. And before we part ways, I have to ask: Do you have a fandom that you especially love to base classes on? All of them? I’d have to defer to our scriptwriter on that. My guess is she’d say Xena: Warrior Princess, since that’s her favorite fandom always and forever. We have had so many great scripts over the years based on a wide variety of fandoms. Generally speaking, the silliest scripts have been the most popular. It’s truly remarkable when you’ve had a class where at the end our abs hurt, not from too much boat pose, but from laughing.